1 - The water. 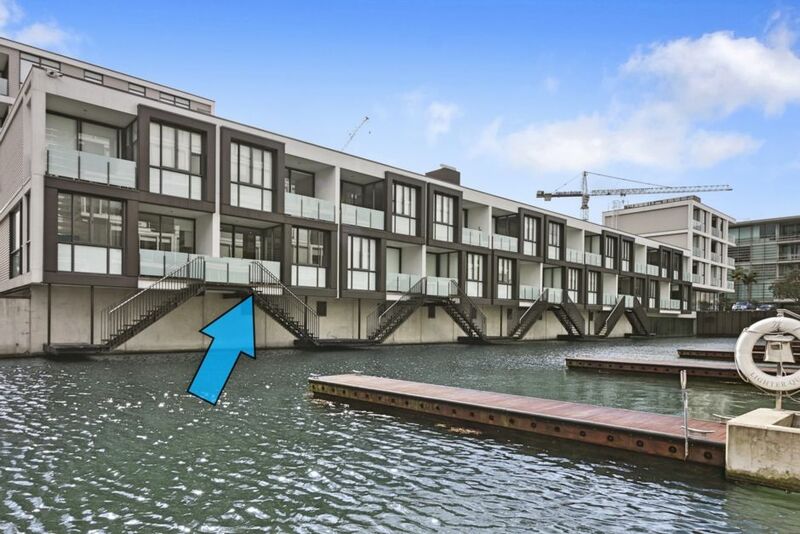 You have so many choices of how you enjoy the private waterway directly below the apartment. You can enjoy the water views from the kitchen while you cook or while you eat at the large dining table. Or you can sit back and relax on the deck directly off of the kitchen. Or walk down the steps and enjoy being directly on the water's edge. 2 - The location is simply outstanding. Lighter Quay is located in the Viaduct Harbour precinct at the base of Wynyard Quarter. It is little more than a stone's throw away from the hustle and the bustle of the city, but provides a quiet relaxed setting. We are isolated from the noise of the central city, however it's just a short 5 minute walk to most of Wynyard Quarter, less than 10 minutes walk to the Viaduct restaurants and less than 15 minutes walk to much of the CBD. This apartment within this fully gated, secure complex is the ideal base from which to explore Auckland and it's close to the many national and international corporate offices. 3 - The layout of this apartment, with two bathrooms and split-able beds, has been very popular with both families and colleagues travelling for work. Comfortable beds with quality linen guarantee a good night’s sleep. 1 - The apartment is in a residential area and close-knit community, so no parties are permitted in the apartment at all times during your stay. This applies to all residents, so ensures you will have a peaceful and quiet stay yourself. 2 - Although private, the apartment is located in a central city neighbourhood, so you will be surrounded by buildings and other residents. That’s not a downside, since the neighbours are generally a very considerate group of people, but you will be aware of their presence on occasion. Most people actually love it, since you will have a chance to meet locals and quickly strike up a conversation. Live like a local amongst locals and you will love your stay. We loved the location and all that was going on around it. Location, location, location of this property alone is enough to justify a five star rating. It is located near the business district of Auckland and within a five minute walk of the bustling Harbor/Bay. The Harbor itself is home to dozens of fine restaurants as well as the main ferry terminal whose ferries can take you to a number of interesting and beautiful islands. If you choose to take overnight trips to North or South of Auckland, as we did, you'll find the main bus terminal with intercity service a short Uber ride away and if you prefer to rent a car,there are several agencies within walking distance. We stayed in this unit for 30 days and found it as advertised, experiencing no issues during our stay. Brendan was extremely responsive, including allowing us early check in and late check out to accommodate our international flight schedule to the U.S.
We highly recommend this unit for anyone planning to stay in Auckland. The apartment is in a great location to explore Aucklands waterfront and experience the urban, metro feel of the city. Had to arrive late at night and Ulf made it easy and was very helpful. Appreciated the Nespresso coffee and the milk! The two bedroom (both with King size beds) and 2 bathrooms made it the perfect place for 2 couples to be comfortable. This property is ideally located in the center of Auckland, right on the Harbor. This property is ideally located in the center of Auckland, right on the Harbor. Easy - beautiful! - walks into Auckland's financial district, ferries, and wharf make this suitable for all types of travelers. The 2-bedroom apt was clean, with towels, a hairdryer, kitchen supplies, washing machine (with detergent), and (most importantly) power converters all provided. There was an underground parking spot that came with the unit - and a car rental agency only a few blocks away. PERFECT place!